Alright, guys. We’re T-minus 5 days until the big day… the biggest eating day of the whole year! Do you know what you’re making yet? You probably have many items you’re planning to put in the oven: turkey, stuffing, pies, rolls, and green bean casserole. 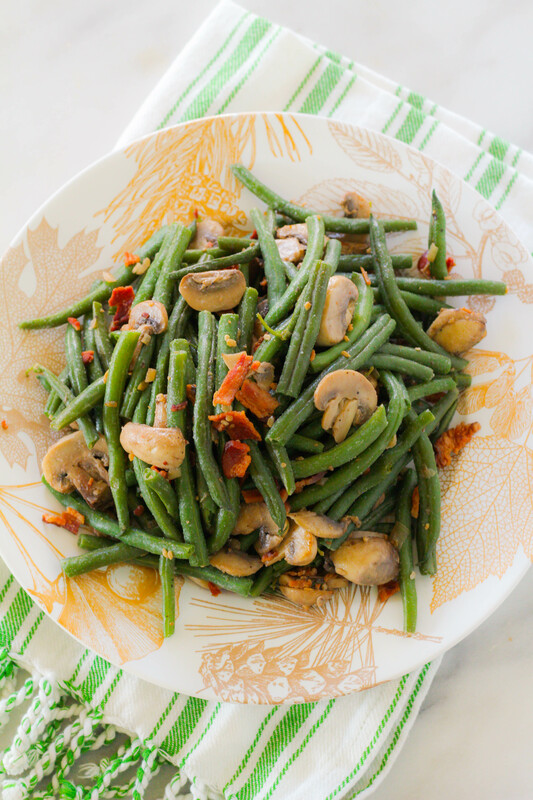 Today I’m sharing an easy variation for green beans that still have that “Thanksgiving” flavor yet clear up space in your oven! It’s time for recipe #4 in my Instant Pot Thanksgiving series! In case you missed it, so far we’ve done Honey Herb Carrots, Pumpkin Mashed Potatoes, and Cranberry Sauce. I’m all about making Thanksgiving a little easier on all of us. The Instant Pot (affiliate link) is my FAVORITE new kitchen appliance. 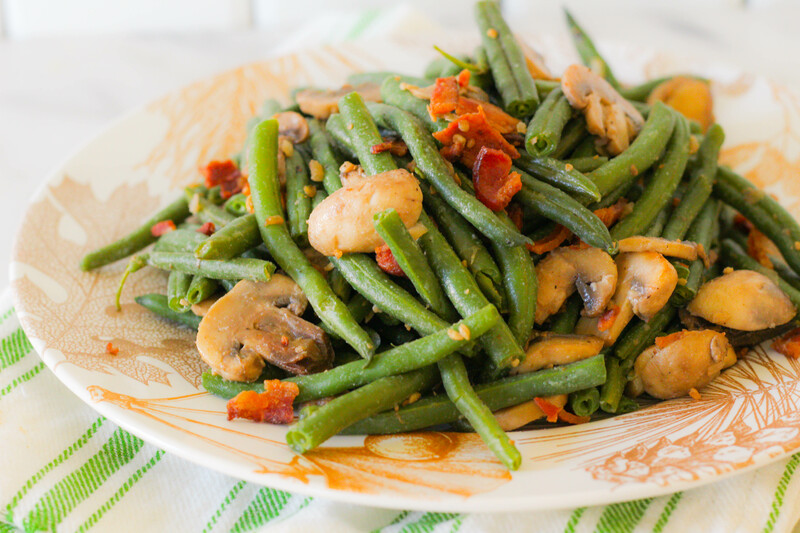 This recipe has fresh and tender green beans, shallots, garlic, mushrooms and bacon bits. And it can be made completely using your Instant Pot! Ta-da! Anything sauteed with butter and mushrooms always turns out great. This lasted in the fridge for several days, so it’s great for leftovers. Tell me — will you be using your Instant Pot this Thanksgiving? 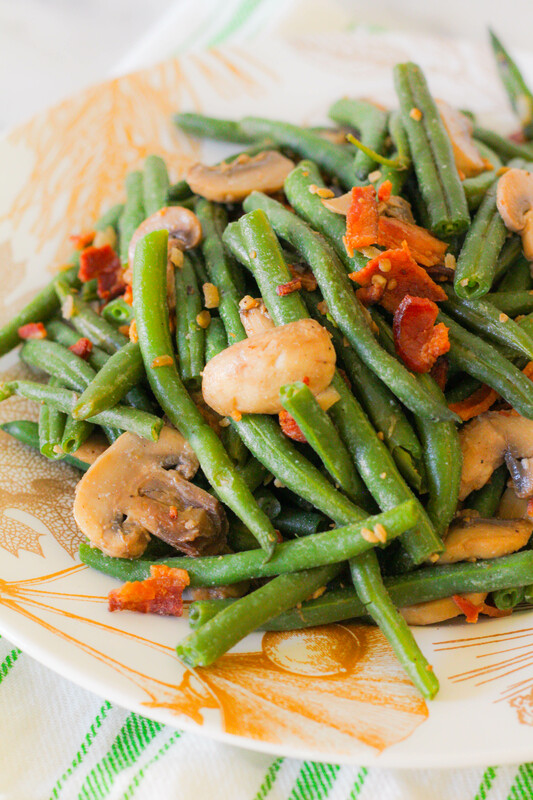 Place the green beans into the Instant Pot. Cover with water (just enough to cover the beans). Close lid and lock, and be sure to close the steam valve. Press "Manual" and set the time for 3 minutes. After times up, quick release the steam. Drain the beans and set aside. Return the insert to the Instant Pot. Press "Saute" and add the butter, shallot, garlic, salt and pepper, vinegar, and mushrooms. Cook until the mushrooms have shrunk. 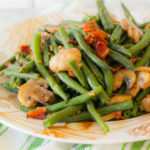 Add the cooked green beans and the bacon bits. Stir to combine. Hi! Is there a measurement for the water or just enough to cover the beans? Yes, either one would work!! Wow! This looks really delicious. My family loves anything with mushrooms. I believe this is a brilliant way to get them to eat some green beans. Thank you for sharing this recipe.